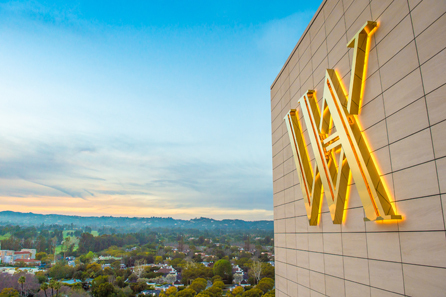 Adjacent to The Beverly Hilton, the 12-story hotel is the Waldorf Astoria Hotels & Resorts’ first new build on the West Coast and second California property, joining the legendary Waldorf Astoria portfolio of now 26 hotels and resorts.Credit: Waldorf Astoria Hotels & Resorts. BEVERLY HILLS, Calif., 2017-Jun-05 — /Travel PR News/ — Waldorf Astoria Hotels & Resorts, Hilton‘s (NYSE: HLT) luxury brand of iconic landmark hotels, today announces the opening of Waldorf Astoria Beverly Hills, adding a much-anticipated, soon-to-be-iconic hotel to the intersection of Wilshire and Santa Monica boulevards – the gateway to Beverly Hills. Adjacent to The Beverly Hilton, the 12-story hotel is the Waldorf Astoria Hotels & Resorts’ first new build on the West Coast and second California property, joining the legendary Waldorf Astoria portfolio of now 26 hotels and resorts. Owned by Alagem Capital Group and clients of Guggenheim Partners, the hotel’s 119 deluxe rooms and 51 suites are part of a world-class, Art Deco-influenced design created by renowned interior design firm Pierre-Yves Rochon, Inc (PYR). Gensler and PYR are the co-design architects of the Waldorf Astoria Beverly Hills. To create a cohesive architectural design inside and out, Gensler designed the master plan for the property and co-designed the exterior of the hotel with PYR. Each of the 170 guestrooms, inspired by the contemporary interpretation of Hollywood glamour and the Streamline Moderne style of the 1930s and 40s, offers unrivaled vistas ranging from a bird’s eye view of the Hollywood Hills to the nearby expansive urban canyon of Century City and well beyond. Every room features floor-to-ceiling windows that open onto oversized private balconies, perfect for drinking in the sunset or simply checking out Rodeo Drive, the Beverly Hills shopping mecca just to the east, within easy walking distance of the Waldorf Astoria. World-class dining comes to the hotel with three highly anticipated venues created by the legendary French chef Jean-Georges Vongerichten. With the elegant Jean-Georges Beverly Hills, the chef’s signature restaurant, as well as The Rooftop by JG and Jean-Georges Beverly Hills Bar, a new standard in fine food comes to Beverly Hills. Helmed by a top-notch team of culinary experts hand picked by Vongerichten and including Executive Chef Steve Benjamin of L’Atelier de Joël Robuchon fame, the chefs are committed to sourcing foods locally whenever possible and a cornerstone of the menus in all the food and beverage offerings at the Waldorf Astoria Beverly Hills. Waldorf Astoria Hotels & Resorts is a portfolio of 25 iconic properties in the world’s most sought after destinations. Unified by their inspirational environments and True Waldorf Service, Waldorf Astoria hotels deliver unparalleled, bespoke service from the moment a guest books through check out. Waldorf Astoria is a part of Hilton, a leading global hospitality company. Experience Waldorf Astoria by booking a www.waldorfastoria.com or through the Hilton Honors mobile app. Learn about the brand by visiting http://news.waldorfastoria.com, and follow Waldorf Astoria on Twitter, Instagram, and Facebook. This entry was posted in Hospitality, Hotels, Travel and tagged Andy Cohen, Beny Alagem, John T.A. Vanderslice, Waldorf Astoria, Waldorf Astoria Beverly Hills. Bookmark the permalink.